Needlepoint stitches can range from very simple to wonderfully complex and can be combined within a single project to offer a wealth of design choices. 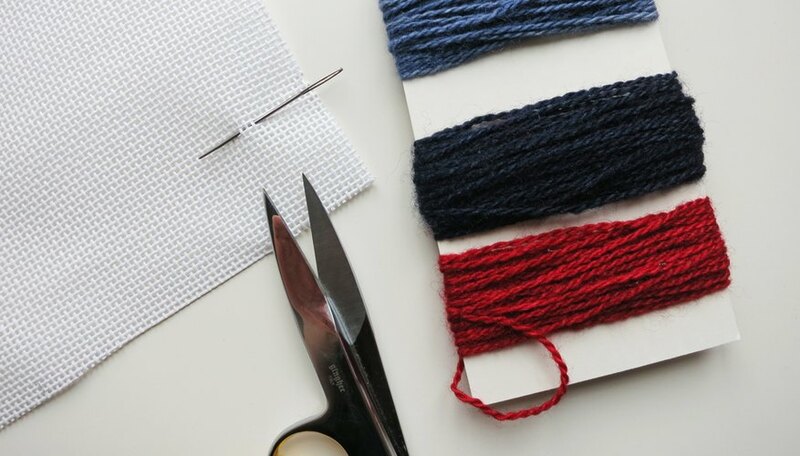 Getting started with needlepoint requires minimal tools - only needlepoint canvas, yarn, a needlepoint needle and scissors. 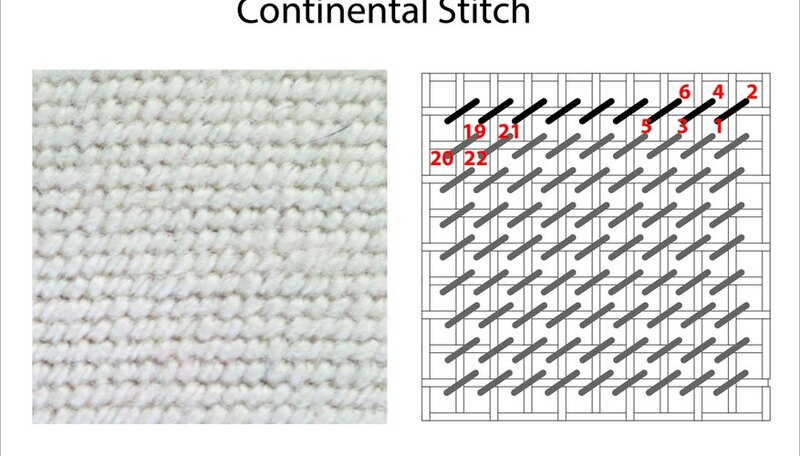 This is the most widely used stitch. 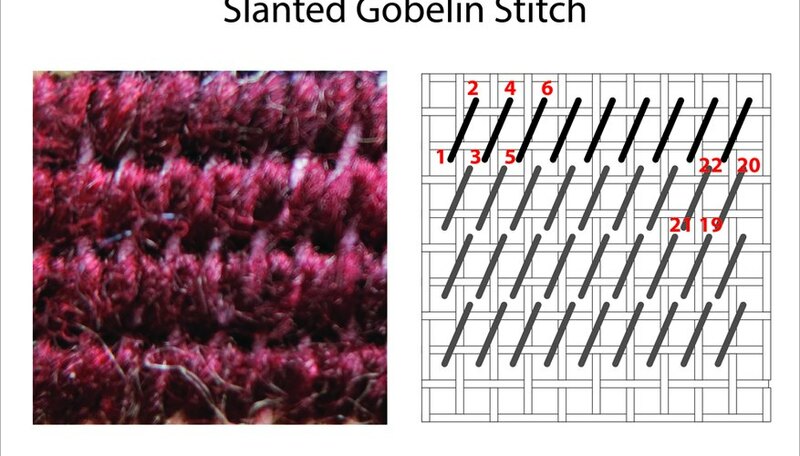 Starting at the right, stitch up and to the right over one diagonal mesh. The next stitch starts one mesh to the left of the beginning of first stitch and ends one mesh to the left of the end of the first stitch. 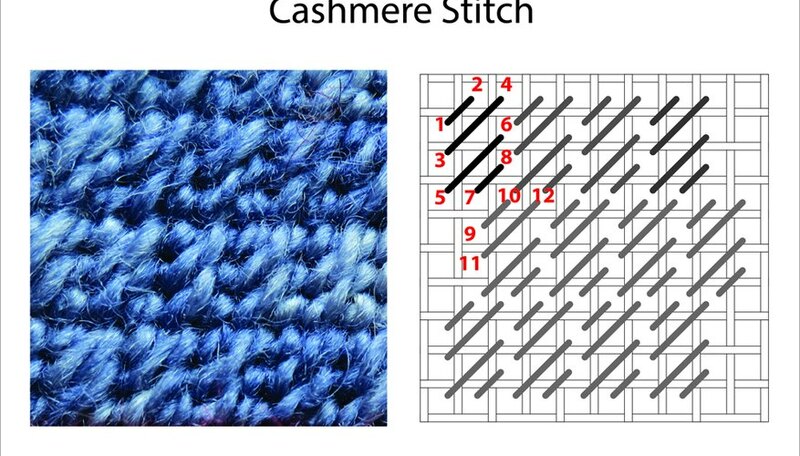 This stitch starts at the left and works over two meshes going up and one mesh going right. The second stitch starts one mesh to the right of the first stitch. In the second row, the stitches are worked the same but progress from right to left. Start the needle at the bottom of a stitch and work the stitch going up over two meshes of canvas. Start the next stitch one mesh over and one mesh up of the bottom of the first stitch. Alternate rows are worked in the opposite direction. This is a square stitch with five parts. 1) Work one diagonal mesh to the upper right. 2) Start one mesh to the left of the first and work to the upper right over two meshes. 3) Start one mesh to the left of the second and work to the upper right over three stitches. 4) Start one mesh above the start of the third and work to the upper right over two diagonal meshes. 5) Start one mesh above the start of the fourth and work to the upper right over one diagonal mesh. Alternate rows are worked in opposite directions. 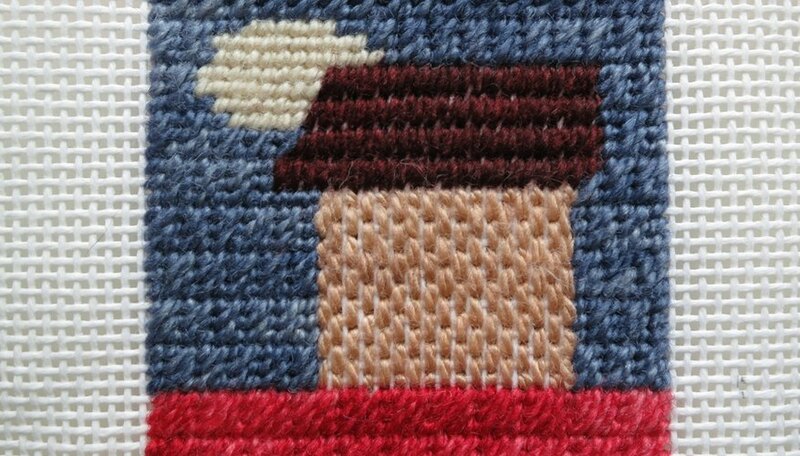 This is a rectangular stitch with four parts. The first part starts on the left and works one diagonal mesh to the upper right. 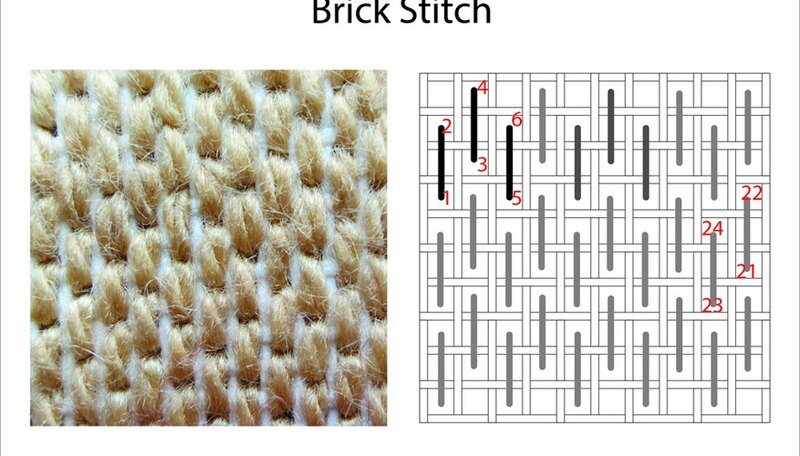 The second part of the stitch starts one mesh below the start of the first and works to the upper right over two meshes. The third part starts one mesh below the start of the second part and again works diagonally to the upper right over two meshes. 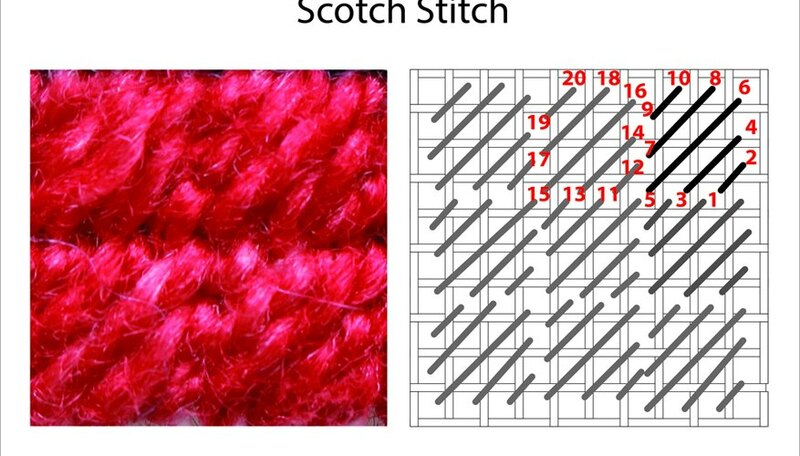 The final part of the stitch starts one mesh to the right of the start of the third part and works to the upper right across one diagonal mesh. On alternating rows the boxes can be in line or offset, as pictured. Erin Currie has been making things her whole life and actively sews, knits, does needlework, crafts, cooks and quilts. She aspires to inspire and instruct on her DIY lifestyle blog at SeamstressErin.com. Mad scientist by day, seamstress by night, she's currently finishing a Ph.D. in biochemistry.